The Detroit Red Wings, the City of Detroit, Michigan minor hockey, the National Hockey League and the entire hockey family lost a great champion this week when Mr. Mike Ilitch passed away at the age of 87. In honour of him and the legacy he has left for all hockey fans, we have pulled this Top 10 list from our archives and updated it — the Red Wings moved from 10th to sixth in the seven years since it was first published on Apr. 26, 2010. Every NHL team has a more immediate goal when a new season begins before they can think of winning a Stanley Cup — making the playoffs. After 82 regular-season games, about half the pack is immediately disqualified from moving on. It’s a challenge. The criteria for making the playoffs have changed over time. 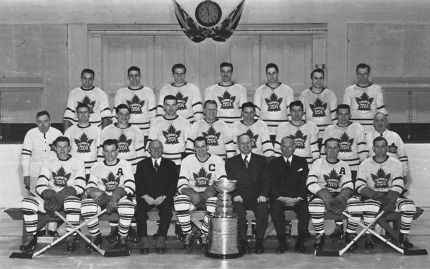 For instance, between 1939 and 1942 there were seven teams in the NHL. Back then, it was difficult to not make the playoffs as six out of seven teams qualified, a whopping 85% of the league. For the first time in 1979-80, 16 teams made it through to the quest for Lord Stanley’s Holy Grail. It has remained that way ever since, except the number of teams in the NHL has gradually increased from 21 to 30 (31 next season). In this era of league parity and a salary cap, just making the playoffs, let alone winning a Cup, has never been tougher. Some NHL franchises have had a lot more success than others in their history at getting to the post-season. Here are the top ten active NHL franchises that have qualified for the playoffs the most often as a percentage of the years they have been in the NHL. All statistics courtesy of Hockey-Reference.com. Active franchise for 49 years. Made the playoffs in 31 years. The Stars have been as successful reaching the post-season in Dallas as they were in Minnesota, making it 14 out of 23 years in the Lone Star State and 17 of 26 in the Gopher State. An appearance in the season’sStanley Cup Playoffs is looking more and more unlikely, but Stars fans can point to 10 Division and three Conference crowns to go with their one Stanley Cup. The Penguins were really not good at making it to the playoffs or going deep when they did for the first 23-years of the franchise. Since the 1990-91 season, though (Hello, Mr. Jagr. Welcome to Pittsburgh) they have been really good at it, only missing five postseason runs and winning four of Lord Stanley’s Cups. Active franchise for 90 years. Made the playoffs in 58 years. After making it 15 out of their first 16 years in the NHL — back when pretty much everyone made it — the Blueshirts have had decent success with making the playoffs for the past six decades. 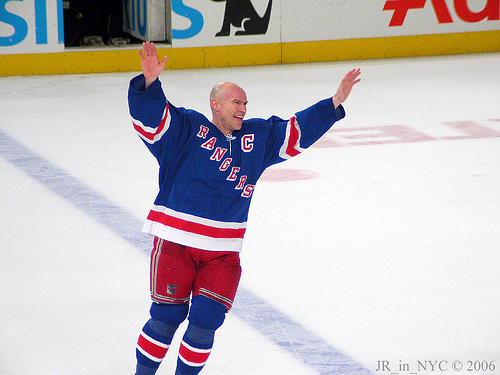 Though they have only one once since their three early Cups — 1993-94, thank you Mr. Messier — they have a good record for playing into the post-season. Active franchise for 99 years. Made the playoffs in 65 years. The last decade, or so, has been rough for Maple Leafs fans when it comes to post-season appearances — and the regular season hasn’t been too much fun to watch either. The often talked about 49 season Stanley Cup drought is still in effect, but this season, the kids in Toronto are doing everything they can to bring excitement back to the Leafs faithful. Made the playoffs in 61 years. From 1958-59 to 1996-97 the Blackhawks only missed the post-season once (1968-69), including 28 consecutive appearances between 1970 and 1997. 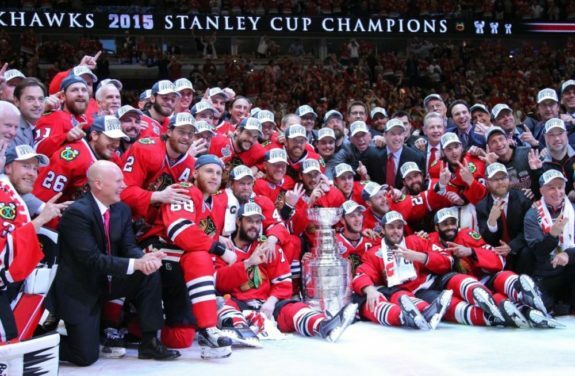 The modern Blackhawks have also been twice as successful as the early Black Hawks, winning three Stanley Cups in the span of 30 years, whereas their ‘forefathers’ earned three in the first 60 years of the franchise’s history. Made the playoffs in 64 years. Tthe Red Wings have made the playoffs 25 years in a row. Thanks to the vision and commitment of Mr. Mike Ilitch, the franchise bounced back incredibly from their “Dead Things” era between 1967 and 1983 when they missed the post season 15 out of 17 times. When you look at the list of Red Wings’ post-season appearances you can clearly see the impact Ilitch and his management teams have had on this storied franchise. Active franchise for 18 years. Made the playoffs in 25 years. 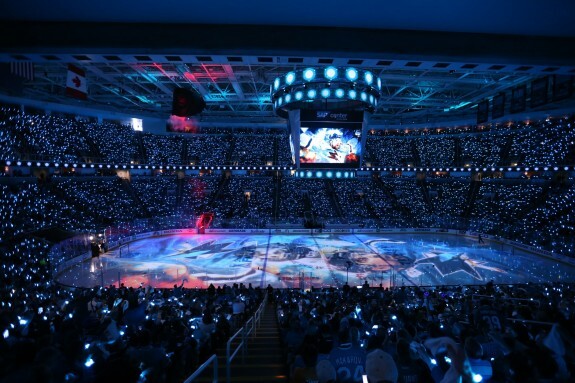 Fans of the San Jose Sharks have been spoiled and they probably don’t know it. Yes, there have been a few early playoff round disappointments, but the franchise is relatively new and they’ve only been barred from the post-season five times in their young history and made it to the Stanley Cup Finals last season. The San Jose Sharks have been one very successful young club in an era of very competitive franchises. Active franchise for 92 years. Made the playoffs in 69 years. 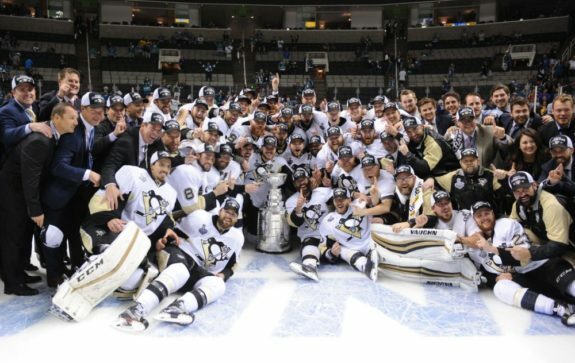 Winning the Stanley Cup against St. Louis. That’s Hall’s stick in the picture. Boston holds the NHL record for most consecutive years in the playoffs, a record that will be tough to beat. Between 1968 and 1996, the Bruins qualified for the “season that counts” an incredible 29 straight times. 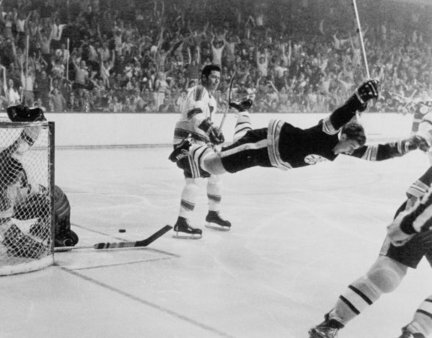 If you discount the 1960’s era just before the arrival of Mr. Bobby Orr, the Bruins have been a very respectable, consistent contender. Made the playoffs in 38 years. Since 1968, the Flyers have only missed the playoffs 11 times. Remarkable! The franchise had its dry spells, one in the early 1990s, missing the show five times in a row and more recently, missing three of the last five. Before and between those misses, though, Philly fans have been treated to lots of playoff action. They have two fewer Stanley Cup victories than their Pennsylvania partner, the Pittsburgh Penguins, but the Flyers have been much more consistent when it comes to qualifying for the playoffs. Made the playoffs in 40 years. Surprise! I bet you weren’t expecting this one. 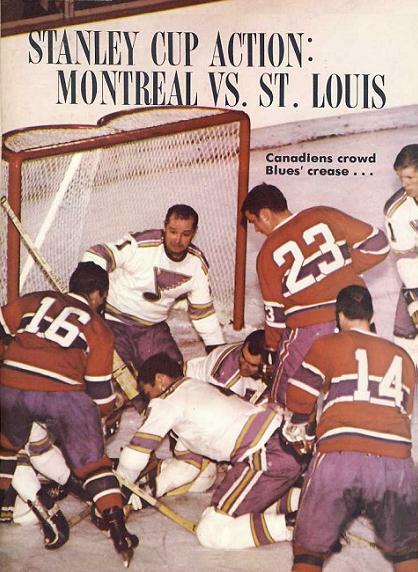 The Blues franchise got off to a great start, making the Stanley Cup Finals in their first three seasons of operation between 1968 and 1970. Although it is true that the NHL lumped all of the expansion teams in one division in those days, the Blues were the early best. More admirable was the club’s 25 year streak of making the playoffs every single year between 1980 and 2004. No Stanley Cups yet, but overall, St. Louis hockey fans have had a great winning team to cheer for. Made the playoffs in 82 years. The Habs have been the best in so many ways, and here is another one. 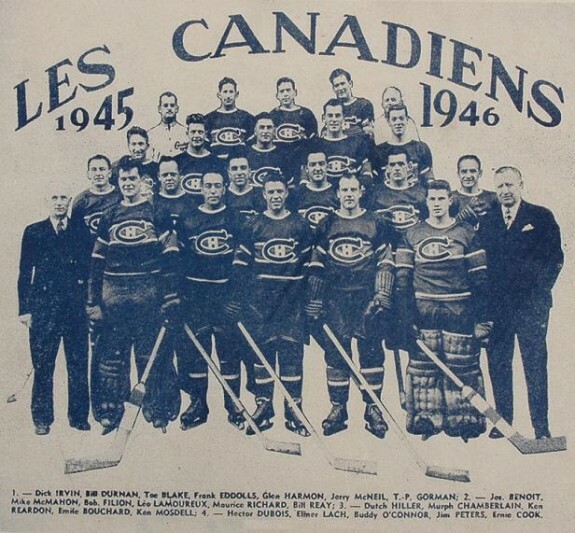 Regardless of the era, the Canadiens have almost always made the playoffs. Even since the 2005 lockout, they’ve been post-season participants four out of five years. In the 46 year period between 1949 and 1994, Montreal missed the playoffs once. It’s no wonder their fans have such high expectations. In their 92 year NHL history, the Habs have never missed post-season play more than three years in a row. In total, they’ve been left on the outside looking in just 14 times. The only other franchise that has been around as long in the NHL is Toronto. In comparison, the Leafs have missed the playoffs exactly twice as often, a total of 28 times. In Montreal, missing the playoffs has simply been unacceptable.